Well, the black circuit is this weeks victim - its been taken down this morning and will be replaced tomorrow with......you guessed it....another black circuit! So, by Wednesday there will be another 40 new problems graded Font 5 - 6a+ for you all throw yourselves at. 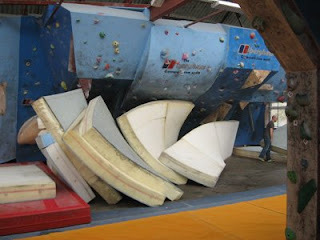 The comp wall reset from last week has provoked a lot of interest, as well as a couple of bruised egos! After Augusts set of problems with their 'holiday grades' (according to one of our customers!) normal service has been resumed with a set of problems that will test even the most burly of boulderers. 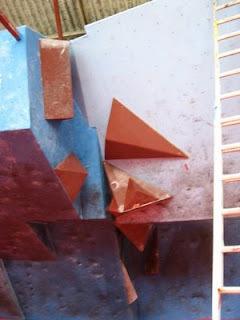 In particular, the 7b+ finger-jamming crack is seeing a lot of action, but meeting with very, very little success! Having just returned from a day or two in Fontainebleau myself, I think the grades now given to the comp wall problems are a little more realistic. Perhaps I should try and get over to Font every month just to check my grading scale is still accurate......we can but dream! 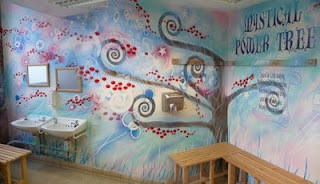 A recent comment this week overheard in the works is Women saying 'have you seen the tree in the toilets?' Funnily enough this has confused many of the guys hearing this. 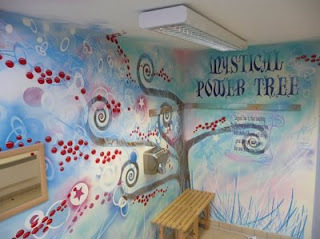 The tree in question is the Mystical Power Tree and it is the latest creation from our design guru Craig. He finished it on Tuesday and as only the ladies have had the pleasure of seeing it we thought it was about time we posted some photos. Continuing on with our Winter lecture series we're happy to announce the visit of the Reel Rock Tour to The Climbing Works on Sunday 9th November. This is the 3rd annual Reel Rock Tour but the first time on U.K. soil with The Climbing Works being it's first stop. The tour is a collection of the best climbing films out there this year with highlights and shorts covering a wide range of climbing. 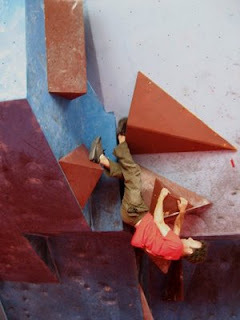 The film night will include snippets from OnSight, The Sharp End, Rocklands South Africa bouldering and The Aerialist. Tickets are only £6.50 or £6 concession. They're available to purchase either online at heason.net or at the reception at the works. This promises to be a very good night and should get you fully excited for the grit bouldering season ahead. You can watch the trailer below (with the amazingly deep American voice over that is actually a little bit disturbing. I think so anyway...). 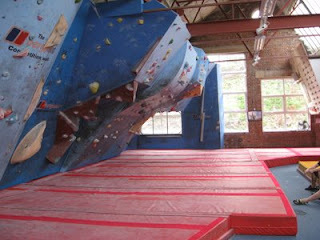 The Comp Wall has been reset with 29 problems from 4+ to 7c+. Enjoy!! The last few days has seen a lot of changes in the works, some subtle, some not. One of the obvious changes is that the comp wall is currently undergoing a reset which should all be finished by Wednesday evening. 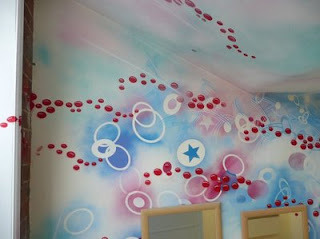 Other changes that the ladies will certainly notice is that the Women's toilets have undergone a bit of a makeover. 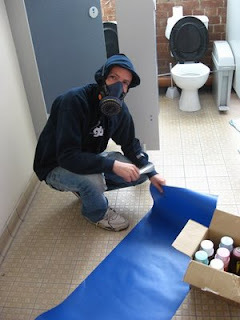 Our man Craig has been in and has obviously been inhaling too many spray paint fumes as his design is something 'out there'. All good though. 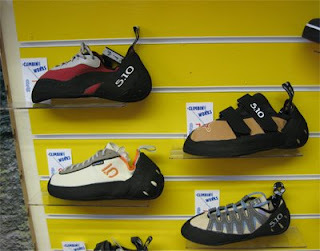 Today we've added to our fantastic range of climbing shoes with the arrival of Five-Ten. 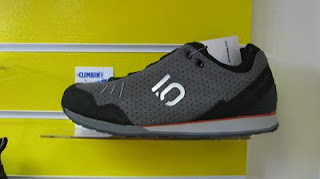 For those in the know, Five-Ten offer a fantastic range of climbing shoes and we've got the pick of the bunch with the new Anasazi Lace-Up, classic Anasazi VCS, Dragon & Women's Siren all in store. Also soon to arrive will be the Anasazi Low Volume which replace the older, but very popular, Anasazi Women's (the blue velcro). 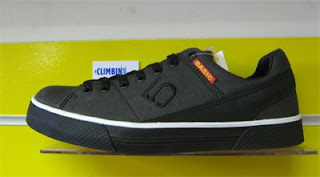 Five Ten have also some pretty nice approach / city shoes so we've also added the Ba5ic and the Freerunner to our store. Sizes are a little sparse in these as they've already been raided by the staff. If you don't see your size, don't worry, they'll be back in stock within the next 10 days or so. More good news - the competition wall and campus board are now fully reopened. Following on from last years winter lecture series The Climbing Works is psyched to announce another winter of films and lectures. This year we're starting off big! 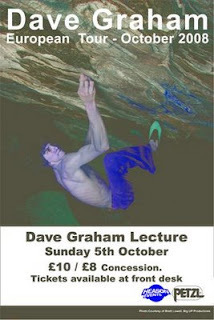 Dave Graham comes to The Climbing Works on Sunday 5th November. Dave Graham is a phenomenon. Since starting climbing in his home area of New England he has continuously pushed the boundaries of sport climbing and bouldering. 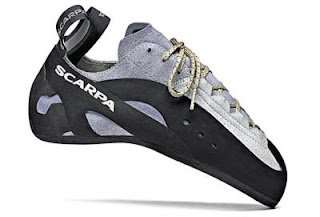 He's climbed F9a+, bouldered numerous 8b's & 8b+'s and is well known for his stout grading (he's downgraded a number of hard problems after quick repeats). He's travelled all over the world and currently calls Switzerland home. Tickets available now at The Climbing Works front desk or on 0114 250 9990. Ticket price is £10 / £8 concession. On the night itself the lecture will start at 8pm with drinks, food & raffle also available. 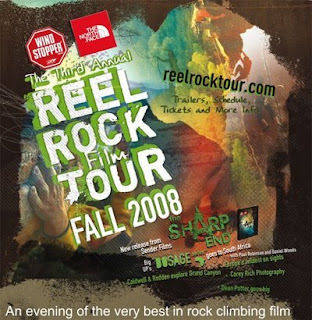 Coming this winter to The Climbing Works - the Reel Rock Film Tour, Gaz Parry, Dave Pickford and more. 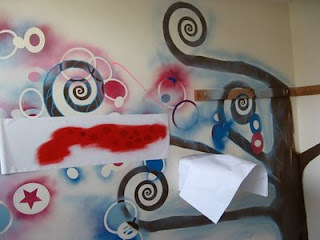 Keep an eye on the blog for more details. Continuing on with our carpeting theme we have had to close the Campus board and the right hand side of the competition wall for the next couple of days so to prepare the mats for the new carpets. Hopefully the wall and the campus board should be back open by Wednesday evening but we'll let you know if delayed. 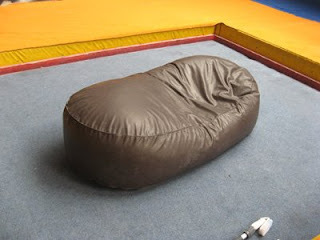 On a good note, the boyz from Holdz (who are doing the carpeting of the mats) have also returned our beanbag full of new foam. The previous innings had taken a right hammering but once again we have a very comfortable mat to relax on.